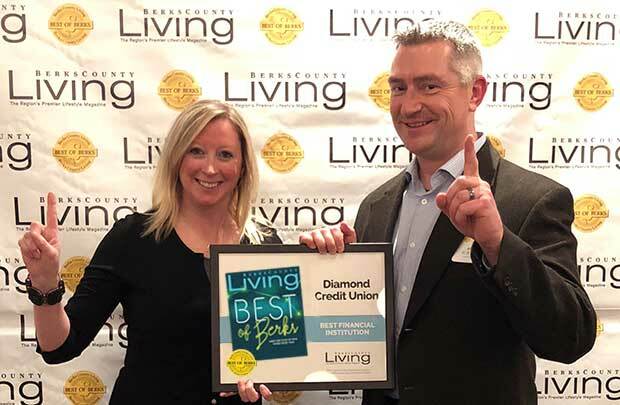 Diamond Credit Union has been named “2018 Best of Berks – Financial Institution” by Berks County Living in the magazine’s annual year-end “Best of Berks” edition. This is the first time Diamond has received the honor which is determined through votes by readership and the community. Diamond is the first credit union to be honored. L-R: Diamond Credit Union’s Cori Garber, Exeter Branch Manager, and Rob Hackash, Marketing Manager, accept the 2018 Best of Berks – Financial Institution Award. Berks County Living named businesses “2018 Best of Berks” in 35 different categories that covered a wide-range of products and services, such as the best: place to watch the game, place to buy fresh seafood, hair salon, veterinary practice and more. A special event was held on December 6th in the Neag Planetarium at the Reading Public Museum to recognize the winners. The “2018 Best of Berks” award is one of several honors Diamond is humbled to have received in 2018. Delivering award-winning service to our membership … That’s younity.